Debucourt trained as a painter at the French Academy and exhibited pictures at its official Salon throughout his career. In the 1780s he began experimenting with color intaglio prints that reproduced his own compositions representing the elegant lives of the French nobility in the years before the Revolution. Most of the prints he made later were reproductions after the designs of other artists. 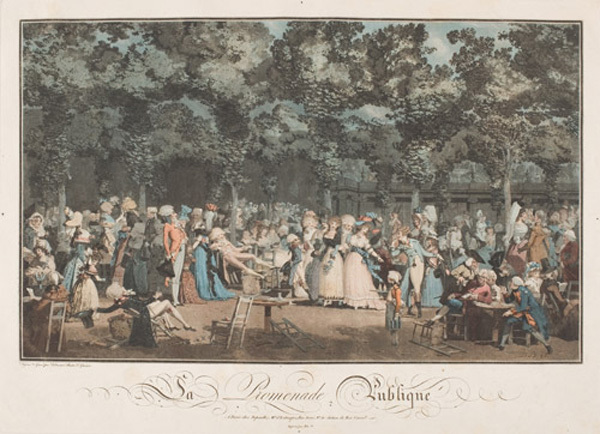 The Public Promenade was inspired by Vauxhall Gardens, a print made in London in 1785 by Thomas Rowlandson, which was an instant success on both sides of the channel. Partly society fashion plate and partly gossipy caricature, that large color aquatint depicted the celebrities and the upper crust of cosmopolitan London parading themselves at the city's most famous night spot. By the time Debucourt produced this, his own French version, seven years later, he had become interested in new printmaking techniques that simulate the look of watercolor paintings. His achievement here is the last and perhaps the greatest French color print of the eighteenth century. Engaging in its satire, the print is also provocative in foreshadowing the massacres of the French nobility in September 1792.